Phoenix, Arizona — The Greater Phoenix Convention & Visitors Bureau announced today it has been awarded accreditation from the Destination Marketing Accreditation Program (DMAP). DMAP is an international accreditation program developed by the Washington, D.C.-based Destination Marketing Association International. 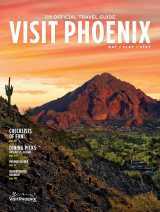 The Greater Phoenix CVB is a non-for-profit organization dedicated to helping the traveling public discover the amenities and attractions of Phoenix and its surrounding communities. The CVB works closely with the local hospitality community to promote and strengthen the tourism product of Phoenix, which is the fifth-largest city in the United States. More than 15 million people visit the Phoenix area annually, contributing $19 billion in direct spending to the regional economy. DMAP is an independent international accreditation body and a leader in defining quality and performance issues in destination marketing. More than 80 destinations marketing organizations are now accredited. For additional information about DMAP, visit www.destinationmarketing.org.